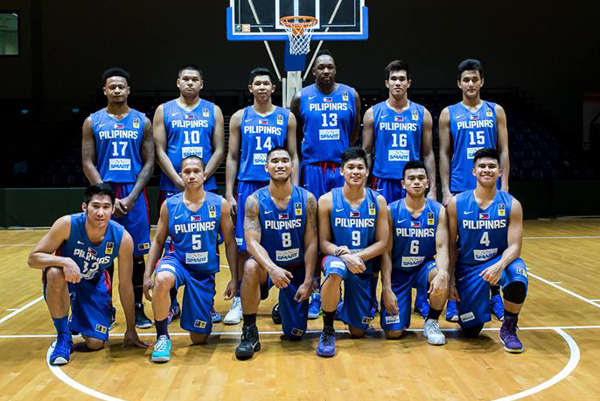 MANILA, Philippines – After a very scary semi-finals win against Team Thailand, our very own Gilas Cadets Men’s National Basketball Team gave the country its 29th Gold Medal by beating Indonesia 72-64 at the 28th SEA Games at OCBC Arena in Singapore on June 15. Everyone was expecting that the SEA Games Basketball Finals’ casts would be power-house Philippines against home crowd favorite Singapore. On the eve of June 14, the Singapore Men’s Basketball Team’s dream of humiliating the dominant Filipino Ballers in their home turf remained just a pure dream as team Indonesia crushed their hopes and booked the last ticket to the finals. Team Indonesia, spear-headed by its ASEAN Basketball League (ABL) - Indonesia Warriors’ veteran point guard Mario Wuysang faced Sinag Pilipinas U23 Basketball Team for the Gold Medal Match. Both squads met at the SEABA tournament couple of months ago where Kiefer Ravena and Ray Ray Parks tandem beat the Indonesians by 56 points. Almost a week ago, they played each other for the group and preliminary roud where Sinag Pilipinas beat Team Indonesia by 29 convincing points. Team Pilipinas felt the warm crowd support from our kababayans, mostly are residing and working in Singapore. Filipino cheers resounded and echoed in the entire OCBC arena which pumped-up Coach Tab Baldwin and his boys. The Indonesians won the opening jump and basket while Philippines started slow with 2 turnovers until Kiefer Ravena placed our team on the scoreboard with a floater followed by 2 clean three pointers from Troy Rosario and Kevin Ferrer. Indonesia’s Sandy Kurniawan closed the scoring gap to the just 7 points after a quarter of gauging and sizing-up. Kurniawan had 10 points in the opening period. Philippines got the double-digit lead in the 2nd quarter courtesy of Baser Amer and Gio Jalalon. Offensive and defensive rebounding and sticky defense of Sinag Pilipinas limited the Indonesians who just scored 6 points until midway of the 2nd period. Frustrations hit the Indonesians to play more physical. Baser Amer got an inadvertent knee to the body in attempt to strip the ball out of Akri Wisnu’s hands. Unfortunately, Amer was called for a personal foul. Philippines had a chance to score one more time before the end of the 1st half but Norbert Torres was trapped at the back court and was forced to do a bad pass. Sinag Pilipinas headed to the dugout with 13-point, 39-26 lead. Mario Wuysang and Akri Wisnu started the penultimate quarter with a tear drop and a bank shot respectively to cut the lead down to 9 points. Indonesia started to gain its confidence. Akri Wisnu sent Kiefer Ravena to the floor with a nasty crossover and located Mario Wuysang at the left corner for a ring-less trey to trim the lead to 5 points. Coach Tab Baldwin called a time out to regroup Sinag Pilipinas and sent Marcus Douthit back to the hard wood. Almon Vosotros fired from downtown and Mark Belo sank both charities to stop Indonesia’s scoring momentum. The Philippines held an 11-point, 58-47 lead marching onto the final and deciding period. Christian Setipu made a back-to-back basket to spice-up the final quarter. Rony Gunawan made a fast-break layup to alter the lead to just 3 points with 4 more minutes remaining in the ball game. Sinag Pilipinas looked so tired in the final period. Douthit can barely jump and run plus Ravena and Vosotros were shooting blanks. Kiefer Ravena who was a sleeper during the first 3 quarters finally broke-up his silence with a break away one-handed slam dunk and followed by a put-back gorilla dunk by Marcus Douthit. Ravena recorded a tournament low with only 12 points. Mark Belo was fouled underneath and was given 2 free throws to secure a 3-possession ball game. Keifer Ravena went to the line twice but only made 3 out of 4. Indonesia didn’t quit too early and made 2 more threes before the final buzzer sounded. Philippines escaped the relentless Indonesians and retained the title, 72-64. With this victory, Philippines Men’s Basketball Team bagged the Gold Medal for the 17th time since the sport was introduced in SEA Games.